Bright the Image. It actually reveals a "round" head and not a Queen head. 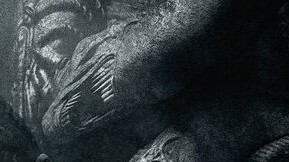 It has the same jawline as the Queen, and i guess if you remove the Crown/Carapace off the Queen then it would look similar, but it also has a AVP Xeno look to it. 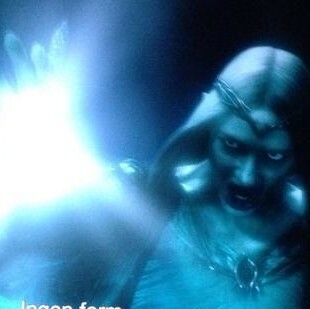 deformed or spawned from nonhumanoids protomorphs, no queens in the mural nor the movie. I noticed that too brego. I have these images in my Pandemonium topic. I don't know if it's a queen but this alien (s) does look different. There may be two other xenomorph types seen below (or more). Here is the source image for the cuts above. I have to say I agree that I do not expect to see a James Cameron "queen" in Alien: Covenant. I believe that the queen people may expect has already been shown. The Trilobite or something else I show below. Dr. Elizabeth Shaw bore a Trilobite that went through rapid growth and was able to overtake an Engineer after zero nutrition from its environment when sealed in the MedPod bay. Black goo is the catalyst (and whatever else black goo can do) that traveled from Dr. Holloway to Dr. Shaw to produce the Trilobite that took the Engineer to produce the Deacon. If the Trilobite is not the queen then I believe, in my opinion, that black goo would be the queen or the womb. Inquisitor, but there is a Human on this planet. In fact there will be a number. David obviously ends up (using Shaw) creating the first true Xeno. Perhaps we end up witnessing the first Hive which finds an Engineer outpost and this poster is the outcome. I think the fact that there are three Queen hints (crown like carapaces) hidden within this poster and we have seen Eggs and Huggers in the trailer means we will probably see some kind of Queen. Big Dave.... A young Queen perhaps? It wouldn't be too surprising if some type of Queen shows up. Cameron's ALIENS appears to be canon to the studio, but I can't see them forcing Queens into Ridley's film, or going that route in this one, unless there's some deeper purpose. Ridley will likely pay respect to Cameron's film by making it possible for the Queen types to evolve after the protomorph eggs are created via other means... IMO something else involving David and Shaw leads to the protomorph being created, and the Queen types emerge later as an adaptive strategy to pump out eggs faster. By allowing Queens to exist alongside alternate reproductive strategies, it increases the species' reproductive success: there's a logical reason to go the egg-laying route (if environmental conditions are right). "Cameron's ALIENS appears to be canon to the studio, but I can't see them forcing Queens into Ridley's film, or going that route in this one, unless there's some deeper purpose." The studio obviously appreciates some of the technology James Cameron added to the story (Atmosphere Processor above and Weyland Storm Rifle below). in prometheus, they say the engineer dome is cleaning the air so its fresh inside, the atmospheric processor is just like the dome eh. What im getting at is the interesting 'aliens:original sin' story, where the engineers were in touch with humanity/weyland All along. Perhaps covenant has been routed to where they have tracked david to, with the intention of letting the crew be sacrificed. The higher-ups might view the workers at the bottom of the hierarchy as pawns to be sacrificed. A decision may have been made at the very top to send David the Covenant crew. Warrior types would sometimes sacrifice themselves in battles against other warrior types - as part of a Queen's endgame. The warrior type Aliens don't need to be asked by their Queen to throw themselves against Marines. They'd do it as a way to test the Marines' defenses, before breaking through. Warriors can be sacrificed, but they cost more than colonizers. So when David says something like "those beings Dr Shaw called Engineers, had rebelled against their creators too and my experiments are the results of their punishment"
So when we then look at the Poster (which wont be in the movie at all) we can then go... oh... so there is that connection. 2) Similar to the above but we will actually see a glimpse of this poster as a Mural in the movie. With David making comments or this time saying nothing and its the viewing of the Mural Poster that allows us to make a connection. I am not sure we will be seeing actual Engineers getting Face Hugged and Birthing any Xenos or any Mutations not as far as Live Ones, maybe we see Sketches or such in Davids Workshop who knows.. I feel this movie is a aftermath movie and that if they cover the past in the next movie, then we may actually see events on screen that cover what this Poster is showing. But as for Alien Covenant i only expect it to be as vague as the Prometheus Mural and Frescos and all evidence of Dead Engineers where we can assume what happened but never actually see the event itself. As far as the Queen i dont think Ridley Scott is going to give us a Aliens Queen, but he wont do anything to make us Question the Canon of Aliens. He may hint at something that could lead to the Eggs or similar to a Queen, i.e a Organism that births Eggs. But as far as seeing anything related to a Camerons Queen i doubt we will see. We have to wander what basis does David have to re-create or create the Xenomorph and other things in Alien Covenant. *Black Goo when interacted in a certain way with a Female Womb can lead to the Trilobite that leads to a Deacon. Because apart from these above, the only other Starting Point for David is if Paradise already had Mutated Xeno Related Organisms or Eggs when he arrived. Which he could use to experiment/create with. All very true Big Dave (and as usual, beautifully articulated). However seemingly on Paradise (which I am fearing will actually be LV426 before some form of catastrophe) we will seemingly be introduced to a native species, the Neomorph which I suspect will lead to David using Shaw and the odd engineer to experiment on, ultimately leading to the creation of the Xeno strain which leads directly to Alien, Aliens and the rest. I suspect that David's stolen Engineer ship will become the Derelict, filled with Eggs via a Queen he creates. Some form of destruction will wipe clean all else on the surface leaving it to look thousands of years old. Indeed, I suspect a Queen will be created. It will lay eggs initially (as we have seen in the trailer) and either this Queen or another will set up the trap on board the Derelict which ultimately leads to Alien. How interesting and genius would it be if David sets off the Cryptic Beacon on board the ship before the planets surface destruction, leading to the events of Alien. Really looking forward to finding out what Ridley truly has in stall. I think it could be a queen. It also could be a way to explain the queen's presence in Aliens. So when the black goo interacts with Walter's Robot DNA what will that lead to? I don't think we have evidence that it will happen. I would think the goo mixed with a synth would create the Xenomorph. So who then @DK laid the eggs we see in the trailer? bregoi I don't know. It is a dome scratcher. Sort of a chicken or the egg question. we dont see a full queen. I guess only time will tell what kind of xenomorph it is. I wouldn't be surprised if Shaw mutated into something beyond human, since we haven't heard much about her.